Iranian President Hassan Rouhani said Monday that Iran would continue to build up its military and push ballistic missile development, despite mounting international pressure to restrain its military expansion. “We have not asked and will not ask for permission to develop different types of … missiles and will continue our path and our military power,” Rouhani said in a speech at a rally marking the 40th anniversary of the Islamic revolution, Reuters reported. Tens of thousands of Iranians gathered in the capital Tehran to mark the 1979 overthrown of the Iranian monarchy in a revolution that put Islamic fundamentalists in power. Life-size replicas of Iranian-made cruise and ballistic missiles lined the route in a statement of defiance at a time of heightened tensions with the United States. Earlier this month the US vowed to pressure Iran to deter its missile program after the Islamic Republic unveiled a new ballistic missile with a range of 1,000 kilometers (620 miles) and tested a new cruise missile, both capable of reaching targets in Israel. “The United States will continue to be relentless in building support around the world to confront the Iranian regime’s reckless ballistic missile activity,” State Department deputy spokesman Robert Palladino said ina statement. “Iran’s blatant disregard for international norms must be addressed,” he said. On Monday, crowds streamed from a dozen of the capital’s far-flung neighborhoods to mass in central Tehran and Tehran Azadi, or Freedom Square, waving Iranian flags and chanting “Death to America” — a chant that has been standard fare at anti-US rallies across Iran. This year’s anniversary comes as tensions are rising with the US and Iran is grappling with the aftermath of President Donald Trump’s pullout last May from the 2015 nuclear deal between Iran and world powers and tough US economic sanctions re-imposed in November on Tehran. Israel’s port city of Haifa is a target in this Iranian game that simulates a missile attack on Israel. 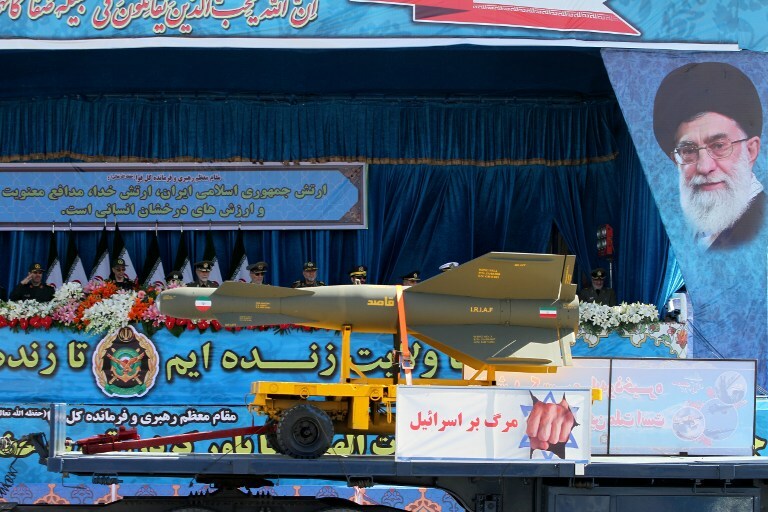 Along with the chants “Death to America,” Monday’s marches were also a backdrop to the military’s display of Iranian-made missiles, which authorities showcase every year during the anniversary celebrations. Last week, Supreme Leader Ayatollah Ali Khamenei defended the “Death to America” chants but said they are aimed at America’s leaders and not its people. It is the first time in 40 years of the same chants that an Iranian leader has bothered to make the distinction. This entry was posted on February 11, 2019 at 4:45 PM and is filed under Uncategorized. You can subscribe via RSS 2.0 feed to this post's comments. You can skip to the end and leave a response. Pinging is currently not allowed.